But of course the people policing don't know that. So it could be a liability thing. Then again, depending on the location, it's totally random. As long as you don't hold your phone up for more than say, 15 seconds or so, it may be all right. I'd just be discreet about it. The question is, Are you alive out there? I think, therefore I rock 'n roll. Well, I saw the final show of the US tour last night. My emotions are mixed. It's a thrill for me to be in the same room as a Beatle, of course. And the All-Starr band really is spectacular. I was a bit annoyed at the "no photos, no video" policy, which is apparently Ringo's rule. I don't really understand why he or his organization would think such a policy makes sense. I also have to admit I got pretty impatient during the Richard Page / Steve Lukather songs. I am not a fan of Toto or Mr. Mister. But Ringo has such a warm presence that on the whole it was a positive experience. I also have to admit I got pretty impatient during the Richard Page / Steve Lukather songs. I am not a fan of Toto or Mr. Mister. But Ringo has such a warm presence that on the whole it was a positive experience. I agree, Lukather is a superb guitarist, particularly on the Santana numbers... On the whole it was a fun show but, for me, having just seen Paul in September...well this was not exactly on par with a McCartney show. Next stop - the annual Lennon tribute at Symphony Space on 12/1 - this year it features Patti Smith and Marshall Crenshaw, among others. With that I will have seen John, Paul and Ringo shows this year... maybe someone will do a George tribute in 2018. 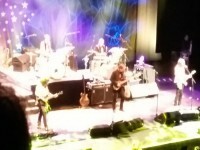 I think part of the reason Ringo likes a "no pictures or videos" rule is for the people who go to his shows. It forces people to be in the moment and other people's experiences don't get ruined by the people in front of them recording on their phone the whole show. Also, I think that taking a picture knowing Ringo does not want that is very inconsiderate. I don't think it's a lot to ask for, honestly. He doesn't want his picture taken. To do so anyways is a clear disregard to the boundaries that he has set. Would any of you want somebody taking pictures of you after you specifically requested that they didn't? Maybe he is on a stage in front of a large audience, but he is still a human being and his boundaries should be respected. I always support artists when they request to not have videos taken. Originally at the Monterey Pop Festival, Janis Joplin refused to be filmed for the official movie despite encouragement that she would get a massive amount of exposure. So why do all of these jackasses with smartphones think it is ok to record another person's music and art for themselves. You bought a concert ticket to WITNESS the music, not film it. Well for the record, I complied with the no pictures rule, but it is literally the first show I have been to in the era of cell phones where such a policy existed. I respect Ringo's right to make such a decision but, having spent hundreds of dollars on the tickets - without knowing about the rule - I was a little annoyed by it.